An aging body is an inevitable result of living, and much of modern medicine is focused on ways to postpone the aging process. Losing weight in Los Angeles is one important aspect of preventing aging, and exercise is a crucial aspect of any successful weight loss plan. Exercise can do much more for your body than just help you to lose weight. It turns out that the best medicine to slow the effects of age, and even outright prevent some effects, is engaging in a regular exercise program. Exercise has been increasingly scrutinized in recent decades for its application in combating disease, such as cancer and osteoporosis. New research shows that exercise also has a role to play in keeping the brain strong and free from the disabling effects of Alzheimer’s and the general decline of brain tissue. Just as exercise has been shown to increase production of growth hormone, a substance that declines as people age, it has also been shown to increase production of a protein that is critical for nerve cell growth and connection. Brain-derived neurotrophic factor (BDNF) is responsible for maintaining brain function, and the decline of brain tissue that occurs after the age of 30 has been directly correlated to decline in BDNF production. Earlier research focused on animal subjects, because measuring BDNF in living humans is not possible directly. Instead, human research has used magnetic resonance imaging (MRI) to compare brain function of humans who exercise versus those with sedentary lifestyles. What they found is that exercise is actually capable of reversing the aging process, at least so far as the brain is concerned. Numerous studies have found that participants who began exercising performed better on cognitive tests, and gains in brain function only build as exercise is continued over the long term. Nothing can stop the inevitable, but exercise offers a proven path to regaining a fresh, young mind. Best of all, there is no specific type of exercise that shows results. 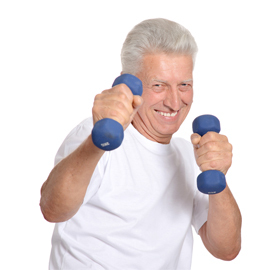 Since the only requirement is regularity, seniors should choose activities they enjoy. Any activity that gets the blood pumping and muscles flexing will provide cognitive benefits.